This year, mostly due to personal sickness, IADW has had a couple of embarrassing 'holidays', so I want to thank all those who have stuck by this site during that time. Whatever you find under the Christmas tree this year - and even if celebrating Christmas is not for you, I hope you enjoy a day of chilled vibes and happy times regardless. 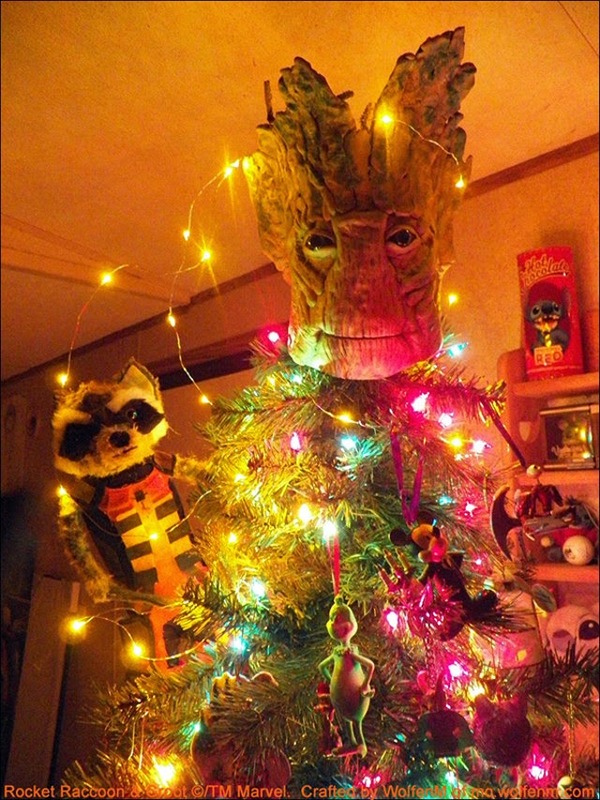 This year will certainly be remembered for Rocket and Groot, and as Groot is a tree that can make little glowing spores float from his hands, there is no doubt he'd make a perfect Christmas tree. Luckily DeviantArtist witchcraftywolfen crafted this sweet Groot tree topper from a CD spool cover, foam, plastic eyes, Crayola Model Magic, pipe cleaners and acrylic paint, giving us all something to marvel at. Rocket plush toy included. Thanks Dale much appreciated! Yeah touch wood things are done aye. On to a bigger and better 2015! You (and this site) are one of the truly bright spots in my life. Thank you for being there to bring a smile no matter what is going on. I only hope to return the favor once in a while, and to say Merry Christmas and a Blessed New Year to you and yours. It is not the lack of adversity that defines us, but the way in which we handle those adversities that mark our character. Love you, mate. Keep typing. Or don't. We'll still be here. Aww thanks Random :-) You guys always make me laugh too and some of your comments are jokes I wish I had thought of when I was typing! Hope you had a great happy holidays and heres to an amazing 2015 for all! Now that's what it's all about! Hope you had a good one, Dan! And a happy New-Year to you as well!!! Thanks ing, and likewise to you!! 2015 isn't that far away!